On the right is a picture of Peter Mackintosh, taken sometime after the early 1840s. Mackintosh was 16 years old and an apprentice blacksmith in Boston when he watched as a gang of young men barged into his shop, smeared ashes from the hearth all over their faces, and then just as quickly stormed out of the place. Mackintosh later discovered that they were part of a mob on their way to Griffin's Wharf to throw boxes and barrels of British-taxed tea into Boston Harbor. That was on December 16th, 1773. And the teenaged Peter Mackintosh had witnessed the first moments of the Boston Tea Party. Later on Mackintosh served in the Continental Army, shoeing horses and repairing cannons. Mackintosh lived long enough for his photograph to be taken at the dawn of the art. 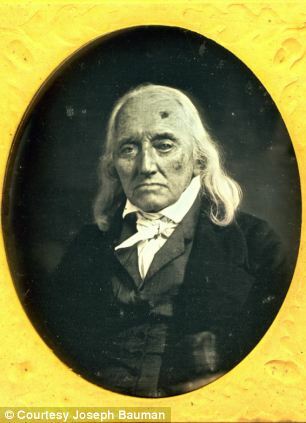 And his is but one of a collection of photos of Revolutionary War heroes who survived long after America's war for independence. Some of these men served personally under George Washington. A few witnessed Cornwallis' surrender after the Battle of Yorktown. Think about that: we are looking into the eyes of men, whose own eyes looked into those of Washington, Hamilton, Greene, and perhaps Cornwallis himself. These aren't painted depictions, but captured moments of these people in the twilight of their lives. 1776 wasn't all that long ago, when you consider it. as another lies dead in the background. io9.com has several more photos of World War I in 3D at the link above.